When I was younger, especially a student at the University of Melbourne, free very much was the magic word. Buy one Whopper get one free at Hungry Jacks, a free yoghurt at Museum Station, or a free beer at the University knitting club recruitment drive. If it was free, it rocked. I mean, I even emptied an entire Gatorade vending machine once, when it was accidentally spitting out its sugary goodness devoid of charge, much to the disdain of my then basketball coach. A six month supply of sporting enhancement never tasted so good! However we all grow up, and most come to appreciate value over cost. That's not to say that we're still not seduced by free every once in a while (hands up who doesn't have a set of steak knives at home that they have never used? ), and unfortunately that includes governments. Especially ones in an election year. Trailing in the polls, Dennis Napthine went on a budget spending spree and included two 'gems': scrapping Zone 2 and free tram travel in the CBD. 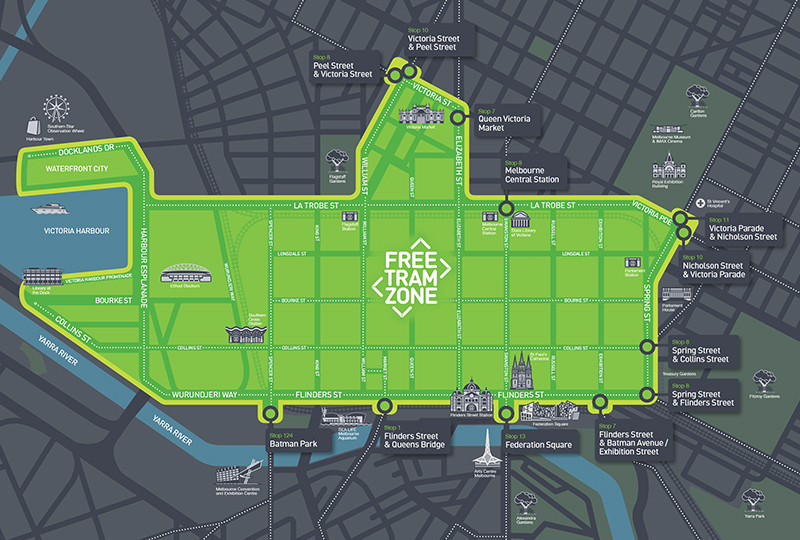 The Free Tram Zone, which came into effect on January 1 this year, is shown above. Like some bright sparks on Twitter noted, if it doesn't immediately make you sing 'we all live in a green submarine', nothing will! Its circumference is basically the route of the City Circle, with a few added areas like Queen Victoria Market and an expanded Docklands. Looking at it more deeply, it really is hard to ascertain who this will actually benefit. Most work day commuters would be coming from outside this zone, meaning they will still have to pay. It has been argued that tourists will benefit, allowing them to avoid the 'confusion' of having to use a Myki. However even the least adventurous of tourists would travel beyond these boundaries, with the key hotspots of the sporting precinct, Fitzroy and St Kilda all sitting outside the free zone. Given they would much more likely be unsure of the boundary than locals, they are also left exposed to fines for not having a valid ticket. Welcome to Melbourne: here, have a $80 on the spot fine! And that brings us to the most problematic demographic: people who actually live inside this zone. One of the main attractions of CBD living is meant to be that you can throw away the car keys and walk to work. Walking, aside from having obvious health benefits, is also the ultimate form of public transport. No cost, with no capacity or frequency issues to worry about. However as tram travel is also now free, it is just an added incentive for these people to get lazy and jump on a tram instead. So aside from the social cost of a less active population, all we end up with is more crowded trams. In other words, the only mode shift this brilliant plan has brought us is from walking to public transport. It won't bring us a single extra cent in revenue (but will cost us $100 million, combined with the Zone 2 change), and we won't take a single car off the road doing it. In fact we run the risk of the opposite; if trams become too overcrowded and slow, commuters may be tempted to get back in their cars and drive to work. A retrogressive policy if ever I've seen one. The plan to 'scrap' zone 2 also makes little sense. Despite Napthine’s bleating about equity, it is anything but equitable. Having users pay the same fare from Pakenham to the city (56km) as from say Brunswick to the city (10km) is counter intuitive and grossly unfair; commuters from the outer suburbs incur a much greater running and maintenance cost on the system than those from the inner suburbs. Having everyone pay the same fare is tantamount to halving the cost of petrol in the suburbs, so that people driving from Dandenong to the city pay the same petrol bill as those driving from Caulfield! This of course would be outrageous; as it would be if the government artificially deflated the cost of housing in the inner suburbs to make that the same across all of Melbourne. Having a flat fare will also further encourage suburban sprawl; a huge problem already exacerbated by Matthew Guy’s reckless decision to extend Melbourne’s already bulging urban boundary. Frustratingly, the perceived political gain is limited anyway. As discussed in Alastair's blog, cost is usually not a driver when it comes to people deciding to use public transport. According to research conducted by the Australian Bureau of Statistics, guess where 'cost' ranked in the top 10 reasons for not using public transport? It didn't! How many times will we hear people say "public transport is still crap, but that's OK cause it's cheap now"? Said no one ever! The fact is, people will accept this 'discounted' price as the norm after a very short amount of time, and go back to complaining about the deficiencies of the system like the price drop never happened. Worse still, this will most likely just jack up the price of a Zone 1 ticket, just like what happened when Zone 3 was scrapped in 2007, making any savings even more trivial and temporary. Unfortunately for Victorians, Labor chose to back this policy for fear that Napthine would whack them over the head with it; another case of good politics, bad policy. They could have easily got on the front foot here and put the $100 million a year these two policy dogs are costing us towards something else: new trams, Southland station (it could have gold plated toilets at that price), Melton electrification, tea cosies advertising the dangers of eating breakfast cereals past their used by date. Hell, anything would have been a better investment. Either way, we are stuck with it now. If they thought it was politically tricky not backing this policy, try undoing it if it goes really wrong and overcrowding becomes unmanageable. The aforementioned limited gain of making it free/cheaper is unfortunately not true in reverse; people will sook like a hipster baby not allowed to have a salted caramel lollypop if we take their god given right to free trams away from them. So next time you have to wait three trams before getting on because of freeloaders, have a think if you are really better off. And next time you walk past a broken vending machine spitting out free Gatorades, make sure you are carrying a big bag! Not sure about more zones. I think we should be charged by distance rather than time. So if I travel from St Kilda to Brunswick, I should be charged the same as from Springvale to South Yarra or Williamstown to Southern Cross or University of Melbourne to Campbelfield. Despite being a CBD resident and being exactly the person you describe who benefits from the new free tram zone policy I actually agree with much of your discussion. At times though you may be carrying a heavy load of shopping or could be a person with some disability where catching a tram for 2 or 3 stops would make a difference health-wise. It's then quite unfair I think to pay $3.76 just to travel a kilometer or two. To that I say instead of having a 'free tram zone' we should allow free travel (or at least reduced fare) for short trips of up to 3 stops right across the network - fairer for everyone. Hmm didn't we once have a short fare ticket ? On the other hand I disagree about your Zone 2 argument. I work in Bayswater and under the old Zone 1 & 2 pricing it actually cost me more to catch a train there than the cost of using my car. Despite having almost door to door service I hence always drove, now with single Zone pricing I have an incentive to catch the train. This is why you need a fare policy similar to Mr Mankowski's the only additions I would suggest are an off peak discount of 30% and a counter peak reduction so that if you are travelling outbound from zone 1 you pay the same as a zone 2-6 traveller however the rules to determine that may be complicated. As someone who lives in docklands I agree that the freezone is a dumb idea. Lets be honest most people in the living in the CBD/Docklands can afford a tram ticket and those who come into the city from the burbs (via PT) already have a ticket. Tourist should be able to buy a "tourist pass" (show their passport) loaded with an amount of days of their choosing (up to 14 days, max 1 tourist card per 6 months). The money would of being better spent on increasing the weekend / late night frequency of all trams across the network. The flow on effects of people travelling to different places for dinner etc would really help some struggling parts of the city and lead towards the "24hr city" Agree with everything above, I have noticed the trams being more crowded then usual and I am guilty of now catching the tram for 2 or 3 stops where previously I would of walked it. Clearly one of the major reasons behind the Free Zone is that the City Circle tram was becoming overcrowded with freeloaders making for an unpleasant experience for the genuine tourists. To that end the decision to start a Free Zone across the CBD definitely has merit. I live in Carlton North and can't bear the thought of forking out $3.75 to travel 6 or 7 stops. The entire public transport system discourages any trip that is a little too far to walk but a little too short to drive unless, of course you own a bicycle. I'll start using the system more when distance based fares are introduced. They can practically do this already with all the technology they have in place but must be too scared to consider it whilst the MYKI debacle is so fresh in people's mind. Distance based charging is how most of the toll roads around the world operate so the system is proven and available. This is why they should have extra zones to reduce the cost of short fares. We will probably never revert to distance based charging as it is too complicated to understand and does not adequately reflects the cost of providing the service as many costs are fixed. I ride to work in the CBD and now get free tram travel... It's a winner for me, means I now tram between meetings instead of bike. A positive that should come out of it is to grow patronage more quickly increasing overcrowding and the political imperitve to invest in new infrastructure/services. The additional income from that extra (zone 2 led) patronage would offset some but obviously not all the lost revenue as well. I actually believe in free public transport. The Miki-Mouse ticket fiasco is part of it but really just an example of the ridiculous. It is regressive. As in it taxes the poor a greater % of their income. Enforcement. This is probably the scariest part. This leads to conflicts and assaults between those that ‘offend’ and those that ‘enforce’. If public transport was free there would be no offence. A progressive income tax is the most efficient and least regressive method of raising revenue. Why do people want to spent money every few years inventing a new way to collect revenue? Just a small increase in the top tax bracket would more than make up for the ticket sales.